Home Latest Stories Foot overbridge collapses in Mumbai. 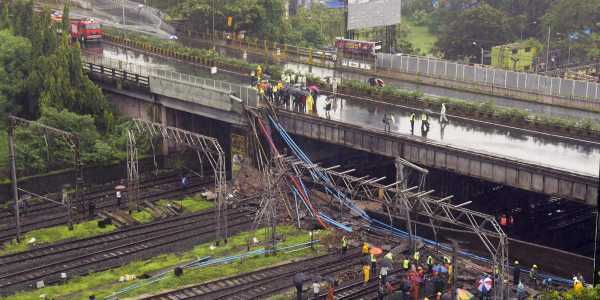 Foot overbridge collapses in Mumbai. At least five people were killed and several others injured after a portion of a foot overbridge connecting platform number one of Mumbai’s Chhatrapati Shivaji Maharaj Terminus collapsed this evening. The disaster management team of Brihanmumbai Municipal Corporation is on the spot and the injured were taken to nearby hospitals. Traffic in the area has been affected. Prime Minister Narendra Modi has expressed deep anguish on the loss of lives in the accident .In a tweet, Mr Modi said, his thoughts are with the bereaved families. He also wished early recovery to the injured. The Prime Minister said, Maharashtra Government is providing all possible assistance to those affected. Next articleIT Dept. sets up control room in Mumbai to curb use of black money in General Elections 2019.